Supak Sookkasikon, MD, is an experienced physician treating patients and acting as medical director at Emcura Immediate Care in Bloomfield Hills and Northville Township, Michigan. Born in the San Francisco Bay Area, Dr. Sookkasikon earned her bachelor’s degree in microbiology from the University of California, Berkeley, before attending medical school in Cambridge, England at the Kigezi School of Medicine. She then returned to the United States to complete her family medicine residency at the University of Michigan. Dr. Sookkasikon’s commitment to her patients and family throughout her medical training led her to pursue a fellowship in integrative medicine at the University of Arizona Center for Integrative Medicine that was created by Dr. Andrew Weil. 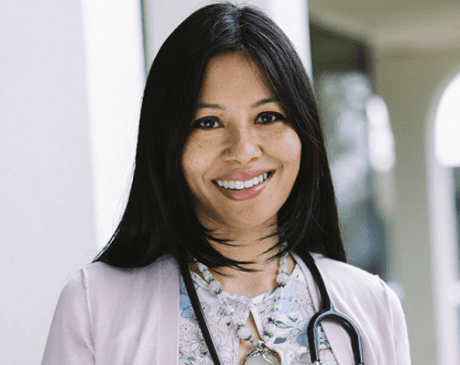 At Emcura Immediate Care, Dr. Sookkasikon brings a wide range of experience to her medical practice, from integrative and mindful medicine to preventive health, urgent care, and occupational medicine. She also specializes in women’s health and stress management, as well as exercise and nutrition to help support healthy weight management. In addition to being an experienced physician, Dr. Sookkasikon is a foodie and yogi who enjoys traveling and spending time outdoors. When she’s not treating patients, Dr. Sookkasikon loves spending time with her family exploring. On weekends, she’s often busy chasing her three sons through the Detroit Institute of Arts Museum, the Ann Arbor Hands-On Museum, or the Henry Ford Museum. Dr. Sookkasikon is certified by the American Board of Family Medicine and the American Board of Holistic and Integrative Medicine. She’s also certified as a medical review officer and is fluent in Thai.